Section 2: How can I use animation with language learners? The example above was created by an English language learner and uses the paid subscription website GoAnimate. The website includes the ability to create a classroom where students can create videos online within a closed environment. With GoAnimate teachers reserve the right to publish to websites such as YouTube. 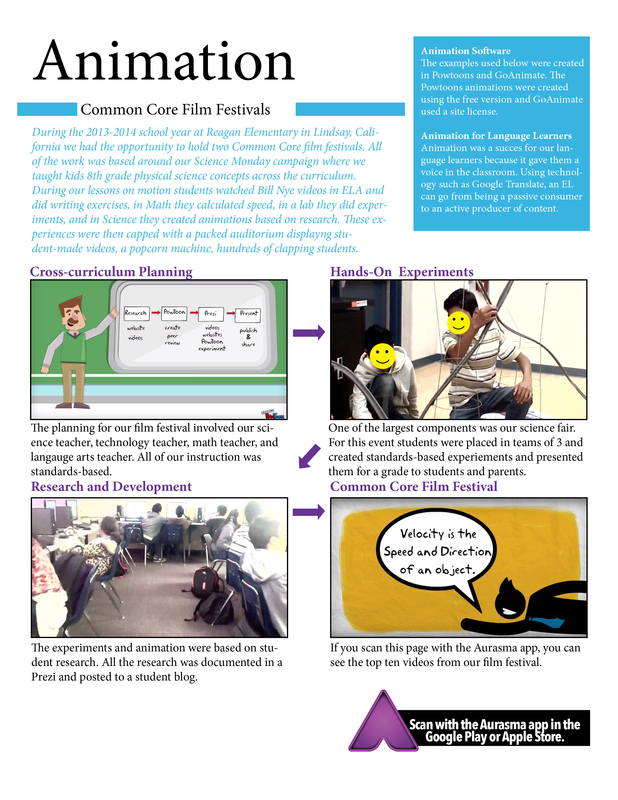 It is possible to use animation as a vehicle for instruction in the core areas. For example if students are learning about theme they can create an animation based around key concepts and vocabulary. If you work in groups, animation has the potential to be a “station” where students rotate creating short clips incorporating a writing skill. Animation software has the ability to authentically engage students if they are familiar enough with the website to use it creatively. I have seen language learners gain more respect based on the videos they created either because of their creativity or because the video demonstrated their intelligence. Keep in mind that just like in regular lessons you will need to include scaffolds, one-on-one, and small-group instruction in order for all learners to reach their potential. The technology does not require drawing skills. Voice to text is exciting technology that tends to engage all learners. Students can use Google Translate to help them make videos. You can use animation across all subject areas. Typically it is easy to share the videos to YouTube or to a blog. Language learners will still require scaffolds, small-group instruction, and one-on-one support. Initially it can be overwhelming for some students because the software is foreign to them. 1. Animation can give a voice to students who are not vocal in your class. Animation gives insight into introvert students and creative storytellers. If you have multiple languages in your classroom it is possible to create videos in these languages. 2. Most animating software is text to speech and already gives you the artwork to manipulate. In this sense you are only animating and not illustrating. The most important component is the dialogue, so I advise you spend a lot of time working on this before you begin animating. 3. You can incorporate animation into any core area. Animation can be centered around themes, vocabulary, or concepts. I have found that one of the best ways to engage language learners with animation is to pair them up with another student who speaks English and have them make an English and foreign language version of the same concept. In this way the student is still getting practice in English, while providing comfort with the home language, and producing unique 21st Century work. Depending on the level of English acquisition a student can also gain added support from Google Translate. Previous post Section 3: How can I make a film festival? Next post Section 4: How can I use video apps in my classroom?